In Windows 7 and 8.1, there was no native way to print to PDF. 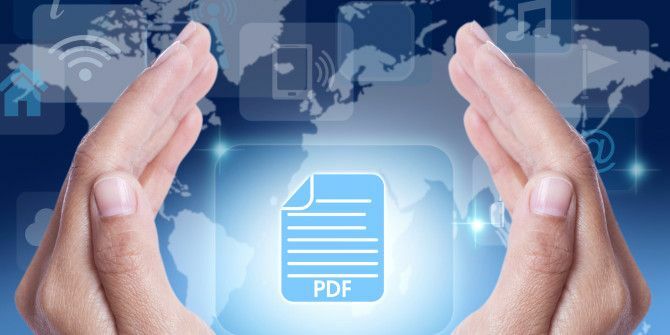 You could get around it by installing some third-party tools 7 Best Tools to Print to PDF 7 Best Tools to Print to PDF Not a single version of Windows comes with a native print-to-PDF solution. So what’s the best alternative? We checked 8 of the most popular options to find out. Read More , but that was quite inconvenient. But with Windows 10, that’s all changed. Take any document and open it in any text editor or processor. Navigate to File > Print, choose Microsoft Print to PDF from the Printer dropdown, and click Print. Choose a suitable name and location for the PDF and then hit Save to complete the process. Do note that the print to PDF functionality works in any application that supports printing. If you can’t see the Microsoft Print to PDF option listed in the Printer dropdown, then it’s probably disabled. To enable the option, go to Control Panel > Programs & Features. Then, under Turn Windows features on or off, navigate to Microsoft Print to PDF and check the box next to it. Restart your computer to let the change take effect. The Microsoft Print to PDF option should now appear under Printers in Settings > Devices > Printers & Scanners. It’ll show up in the list of printers in the Print dialog as well. Why Print to PDF, Anyway? PDF is a standard, cross-platform file format. This makes it easy to share documents and images with anyone. Now that Windows 10 is here, turning files into PDFs is super easy! No extra software needed. It was worth the upgrade to Windows 10 just to get OS-level support for print-to-PDF. Do you still prefer to use a third-party tool for printing to PDF on Windows? Or have you to switched to the built-in functionality that Windows 10 offers? Tell us in the comments! Thanks for reminding me of this. I can uninstall PDF Creator's adware garbage from my PCs now.